Like the pieces of a puzzle we can join them all together. Our photographers carefully scan each room, building a detailed 3D model of the environment. We’ll capture it in stunning detail to deliver an immersive 3D tour for your website, increasing online interaction and reach. 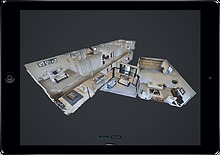 Ideal for Real Estate marketing, our 3D tours give the property a sense of weight and awe unmatched by 2D photography. 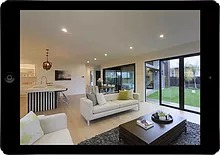 By virtually touring the home or inspecting a 3D layout, potential buyers can relive experiences from a live house viewing and revisit parts of the property which made an impression. Imagine the time saved by agents, vendors and purchasers alike! A unique way to view a gallery or artistic space, our RealScan tours gives unparalleled insight into some extraordinary spaces. Whether it’s to archive an exhibition, provide a resource for teachers or simply catering to those who might otherwise miss out, RealSCAN delivers the perfect solution. 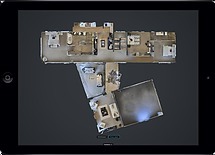 The ideal way to view serviced apartments, independent living and care homes for those with a mobility impairment and their families, RealSCAN enables the viewer to explore large spaces in great detail from the comfort of home. RealSCAN, can be used to create immersive walk through tours of the building site mid construction. Owners can safely navigate their way through the new build without any health and safety concerns, builders can see where wiring and plumbing runs through the walls. Architects can see their drawings come to life and interior designers can start planning the space with ease. The ultimate way for accommodation providers to market both nationally and internationally, a RealSCAN 3D tour showcases the space beautifully and gives a potential customer the means to book with confidence. “I recently had the pleasure of having a property listing scanned and photographed by the RealScan camera process by Marcia Jessen from imaging company Property3D. The property was a unique building in many ways, it was a Temple which had been constructed in the 1920’s and was in largely original condition. Although the exterior looked unkempt, the interior was interesting with many architectural features, stained glass windows, polished timber floors and a lovely stage framed with large pillars. Purchasers were always awed when inside the building but once they had left, the magnitude of the work & cost involved in restoring the building outweighed the sense of potential and their enthusiasm left them. However, the RealScan link has given me a portal which I can forward through to interested parties which recreates the sense of being in the space and allows people to connect with the space emotionally again. This is so important in the selling process as buyers can show the property to their builders or architects without meeting them onsite (saving time and cost) and gives them a real sense of what is there and what could be achieved, all the while re connecting with what engaged them in the space in the first instance. Feedback from purchasers has ranged from “absolutely fantastic thing” to “bloody brilliant” to “where can I get this done”?